The programme allows learners to acquire knowledge and understanding in a range of topics and to develop key skills they require to work in Business Management roles. This is done through a substantial core of mandatory units. The objective of the Level 6 Diploma in Business Management qualification is to provide learners with an excellent foundation for a career in a range of organisations. It designed to ensure that each learner is ‘business ready’: a confident, independent thinker with a detailed knowledge of business and management and equipped with the skills to adapt rapidly to change. The content of the qualification is focused on leadership and people management, strategic human resource management, operations management, sustainable business practice, financial decision making as well as the business research skills expected of a manager. The qualification is ideal for those who have started, or are planning to move into, a career in private or public sector business. 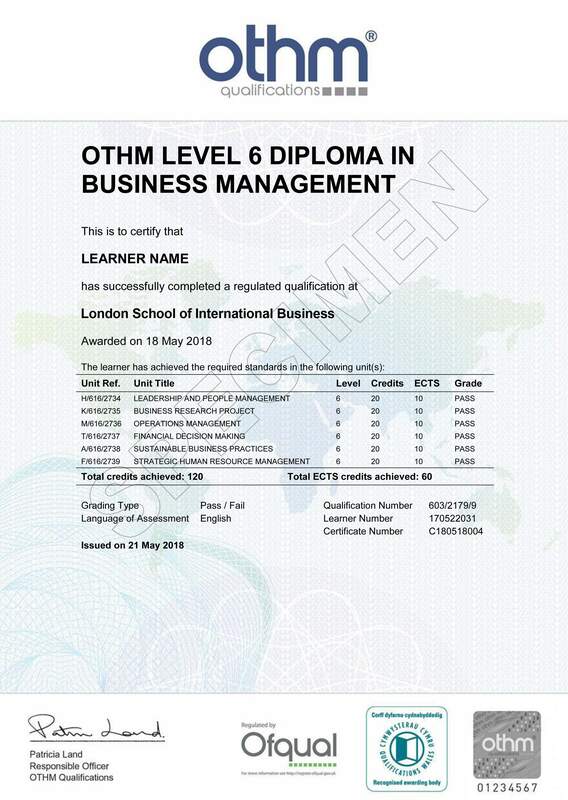 Successful completion of the Level 6 Diploma in Business Management qualification will provide learners with the opportunity to progress to further study or employment. The qualifications at RQF Level 6 represent practical knowledge, skills, capabilities and competences that are assessed in academic terms as being equivalent to Bachelor’s Degrees with Honours, Bachelor’s Degrees, Professional Graduate Certificate in Education (PGCE), Graduate Diplomas and Graduate Certificates. The Level 5 Diploma in Business Management consists of the 6 mandatory units that provide a total of 120 credits. OTHM, UK - an Awarding body by the UK Government’s regulator - OfQual.